ST. GEORGE – The landscape along a stretch of Bluff Street just north of St. George Boulevard changed recently in preparation for an upcoming road project. Buildings that once housed Crazy Bob’s and Jazzy Java and others have been torn down and the ground smoothed over ahead of the planned widening of northern Bluff Street. 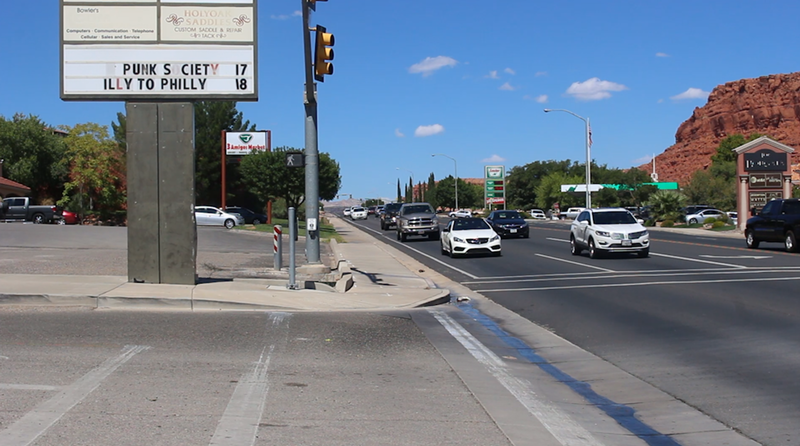 The widening and related infrastructure improvements are slated to improve traffic flow for years to come once completed. The project is now entering its bid phase, said Kevin Kitchen, of the Utah Department of Transportation. It is anticipated that a bid will be awarded during the fall, with additional preparation for construction also taking place. Road work is expected to begin in early 2018 and take approximately 12 months overall. Why do road planners say the project is needed? City and state road planners have been saying improvements to northern Bluff Street are necessary for several years. 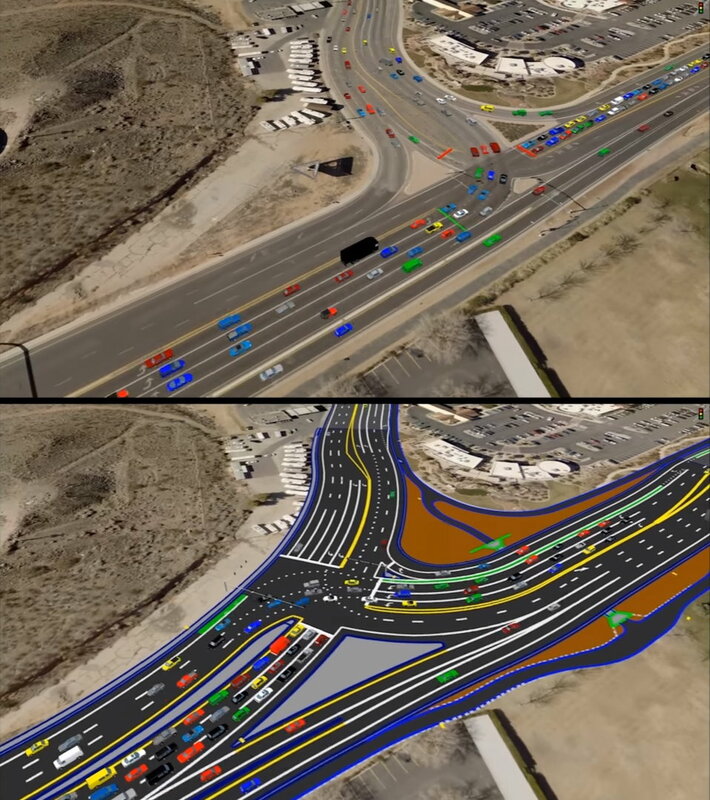 In February 2012, following the completion of an environmental assessment, UDOT held a public meeting displaying future planning possibilities for roadway. A large reason planners say the project is needed is to help deal with current and future congestion as the region continues to grow. Growth is also considered a prime reason for other recent projects, such as the proposed Exit 11 project in Washington City. “UDOT looks at how to deal with traffic volumes over the next 20 to 40 years,” Kitchen said. Currently Washington County sports an estimated population of over 150,000 and is projected to more than double by 2040 at around 321,000, according to the a report from University of Utah’s Kem C. Gardner Institute. With that population growth comes a lot of cars and the need to plan for them, Kitchen said. A large volume of traffic currently on northern Bluff Street flows between Sunset Boulevard and St. George Boulevard as motorists move between St. George’s western and eastern halves. While Bluff Street itself is a north-south road, Kitchen said it is also one of the city’s primary east-west corridors. UDOT is overseeing the project due to Bluff Street actually being a state road – part of state Route 18. Bluff Street will be widened to three lanes north of 100 South and up through the intersection with Sunset Boulevard, at which point it will narrow to two lanes once more. On either side of the widening roadway will be added space for bicyclists. 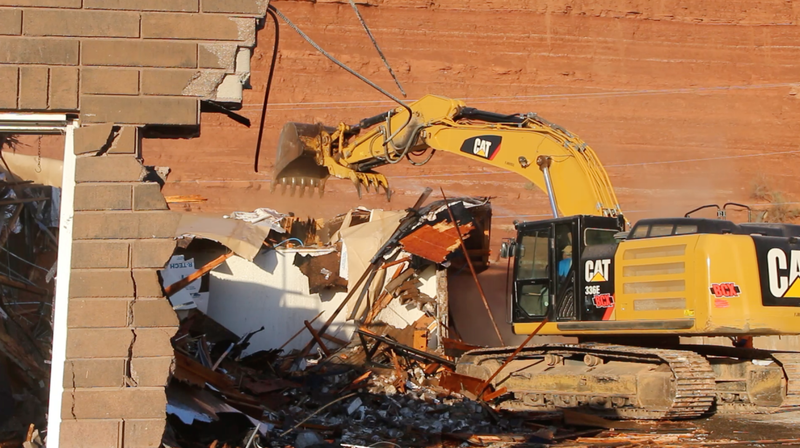 It is the widening and related right-of-way acquisitions along Bluff Street that resulted in the a handful of buildings being bought by UDOT and ultimately torn down. While making way for the road-widening, it also led to over 20 businesses along Bluff Street having to relocate. In addition to the widening, the Bluff Street-Sunset Boulevard intersection will be redesigned. Currently traffic is directed north on Bluff Street with multiple vehicles stopping in three lanes that wait to turn left. The new design will allow the traffic to make a smoother transition onto Sunset Boulevard. Part of the new intersection will include an underpass for pedestrians so they can cross from the east side of Bluff Street over to the Sunset Corner shopping area. The overall cost of the Bluff Street project has been estimated at around $51 million. Other area UDOT projects of note include the addition of auxiliary lanes to Interstate 15 between mile markers 4 and 5. The addition of the new lanes is anticipated to improve traffic flow and safety between the Brigham Road/Exit 4 and Dixie Drive/Exit 5 interchanges. Work on this project is slated to concluded by the end of the year. I’m really glad they abandoned the dumb U-turn plan they had before for the St. George Blvd / Bluff intersection, where to turn left onto St. George Blvd when driving south on Bluff you would have had to go to 100 South, do a U-turn, and then turn right. They did that in Draper and everyone there hates it. I’m also glad they aren’t doing the Sunset Blvd intersection with the huge overpass ramp they were planning to use. It does seem like some of the buildings they knocked down weren’t actually necessary to the project and were just a way for the owners to get top dollar from the dilapidated buildings on the taxpayer dime. Many were set back further than Kneaders but still got razed. The pattern seems to be new vs old rather than based on the distance from the road. That being said I’m glad they’re gone, I’d just rather it wasn’t on the taxpayer dime under the guise of a new road. Also I’ve noticed on St George blvd entering I-15 North if you are not from here you can get confused with the way they designed it. In other places in the turning left lanes you have the option to either turn or continue to drive forward. Also when it rains you don’t know which lane you are in the sun fades it fast. Is there an alternative to fix that? Can you put the reflectors as lines instead of paint? I know it’s a money issue. Not having reflectors is less a money issue and more an issue with snow plowing, since they stick up out of the road. Some places have reflectors embedded in a lowered section of the road, but they cost a lot more and aren’t as effective. Utah does have a problem of not being able to see the lines when its wet, as do many other states. They have the flexible reflectors that stick up, but those are just temporary during repaving jobs and would probably get destroyed by snow plows as well (and probably wouldn’t last anyway). $340 for every man, woman, and child in Washington County, just for this one project. And I don’t get it; the traffic is not that bad on Bluff. Only at busy times does the left-turn lane back up a bit at St. George Blvd. No problems at Sunset. I use this road all the time. I don’t understand when people say it is bad traffic. Apparently, they’ve never been to Los Angeles or Las Vegas or Orem. Or the Virgin River Gorge during construction or on holiday weekends. I,m not sure when Steve goes in this intersection,, I have been here 22 yrs. if it’s 7:50’am or 8:50 am it backs up on sunset even on valley view .. After 3:30 pm til 6 pm it’s bumper to bumper .. They and get in and out of these businesses us horror show.. The meadow ice cream trucks should not be allowed on bluff.as they block traffic anytime..
Trucks enter in and out if color land making it dangerous to go up bluff.. I avoid thus intersection and go around Indian hills and up main st..I hope this will help.. I feel sorry for businesses in both sunset and phoenix plaza after this happens..
I’ve been here for close to 20 years. Traffic in St. George is nothing compared to what it is in Los Angeles. Eventually, the “Gobble up private land under the guise of eminent domain and widen the road because there will be more cars” solution doesn’t work. Public transportation, bicycle lanes, carpooling works without destroying homes or businesses. $51 million? Foolish spending. We’re from Manhattan and we think there is a lot of traffic in St. George – rented off River between Riverside and E. Brigham. Therefore, we bought in Hurricane. One note: the blinking yellow lights should be eliminated and solid red and solid green turning arrows are absolutely necessary. I’m no wimp – I drove 3rd Avenue in Manhattan during rush hour in a little 1973 VW beetle surrounded by yellow cabs. Hope they add a few traffic lights for left turns. Making a left can be hazardous! Either my comprehension has gone down hill quickly, or this is one big pork project! They are trying to make it sound like it’s the best thing for St. George. But it looks to me, like it is just a revamping of what the current traffic patterns are. All they are doing is adding a third lane, and a couple of triangle safety islands. The one thing that makes any sense is the pedestrian underpass. But even this is a two edge sword. Other cities have used these underpasses only to find they are a breeding ground for crime. Everything from dope dealing to robberies to rapes and homicides. OK, now back to the vehicle traffic. No doubt the extra lane between Blvd and Sunset is going to be a big help. But in looking at the two intersections, Blvd and Bluff and Sunset and Bluff, it appears that the change is going to be primarily cosmetic. I agree with the poster that said it looks like a lot of what was knocked down was unnecessarily done at taxpayer expense. Therefore, pure pork for those property owners. I forgot to add one more thing about the tunnel. We will have homeless folks congregating there to get out of the sun, or the foul weather. I hardly ever see traffic on Southern Parkway. That’s why I use it – the long way, not a shortcut.